Ruling out any possibility of advancing assembly polls-2017 in the state, the Punjab Chief Minister Parkash Singh Badal emphatically said that the state would go to polls on the stipulated time schedule.Talking to the media persons here on the sidelines of his Sangat Darshan program in the Nurpur Bedi block of Ropar Assembly segment, Mr. Badal said that there was no question to pre-pone these elections and would be held on its due date.Asked to comment on the likelihood of triangular contest in the state assembly polls, Mr. Badal replied it was immaterial for SAD-BJP alliance which political party contest these elections. The Chief Minister, however said that he neither underestimated the potential of any prospective candidate contesting these elections from any political party nor even of an independent candidate.On the issue of handing over the inquiry into the case of Sikh preacher Baba Ranjit Singh Dhadrianwale to the Central Bureau of Investigation (CBI), the Chief Minister said that there was no point to refer this case to the central agency as the state government had already entrusted the aforesaid inquiry to the Police department for thorough investigation, which was fully competent to get into the bottom of the case and several persons have been arrested so far allegedly involved in this unfortunate incident. Mr. Badal said, "It would be far better to wait till its final outcome rather to preempt anything now on the matter. "Referring the issue to beef up security around Sri Harmandar Sahib Complex at Amritsar in wake of anniversary of Operation Bluestar, the Chief Minister said that it was the bounden duty of the state government to intensify security arrangements as a routine affair for ensuring law & order situation besides maintaining peace, communal harmony and brotherhood during the Ghallughara week, which was observed every year from 1-6, June.On the issue of illegal mining of small minerals in Nurpur Bedi block and Sri Anandpur Sahib Sub-division, the Chief Minister categorically said that the state government had already issued strict instructions to all the Deputy Commissioners and SSPs across the state to curb this unhealthy practice and ensure their strict compliance. He also asked the SSP Ropar, who was also present in the Sangat Darshan to take stock of the situation and initiate corrective measures forthwith.Replying to another query about any possible adverse decision against Punjab in the case of river waters already pending in the Apex court, the Chief Minister said that he has already clarified his stand not once but several times that he was ever ready to make any supreme sacrifice to safeguard the interests of state with regard to state's share in river waters as per the universally accepted Riparian principle. Allying fears about any injustice done on this count, not only the state's agriculture, trade, commerce and industry would be perished but the life of common man would also be adversely affected as water was its only natural resource and lifeline. He also called upon the people to be prepared for any sort of sacrifice to protect their river waters otherwise Punjab would soon turn into desert. 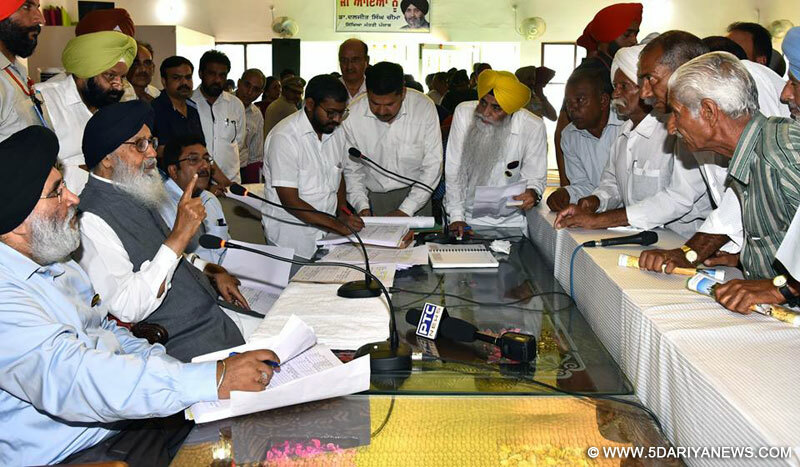 Earlier addressing a gathering of 68 Panchayats from Nurpur Bedi block in Ropar Assembly segment, the Chief Minister forcefully said that Sangat Darshan program was the most effective medium to redress the grievances of people to their satisfaction on the spot, in which three different components viz. Public, State Government and District Administration work in tandem to resolve their issues. He said that Sangat Darshan program was also instrumental in guiding the state government to formulate policies to better the quality of people's life.Cutting across the political affiliations, the Chief Minister also appealed the opposition to shun criticism and its skeptical approach towards Sangat Darshan program rather they should extend all out support and cooperation to ensure all round development of the state, as this unique program was not at all political rather it was only development oriented to propel the tempo of growth and economic prosperity in the state. Mr. Badal asked the officers of Punjab State Power Corporation Limited, Punjab State Tubewell Corporation and Department of Water Supply & Sanitation to visit the villages in the region during the next fortnight to assess the ground realities and take necessary steps to ensure regular supply of electricity, installation of deep tubewells for irrigation and supply clean and potable drinking water besides allowing provision of toilets in their households. He also approved a plan of Rs.15 crore to provide safe drinking water and the facility of toilets to the inhabitants of these villages in Nurpur Bedi block. The Chief Minister also assured the local residents in the area to permanently solve their problem of acute shortage of water both for drinking and irrigation purposes in this sub-mountainous belt (Changar region) on the top priority. He disbursed cheques worth Rs.2.11 crore to 68 Panchayats as development grants for the execution of ongoing and new development works and welfare schemes in the region. Earlier welcoming the Chief Minister, the Education Minister and Ropar MLA Dr. Daljit Singh Cheema said that Mr. Badal was committed to ensure overall development of this difficult area and prosperity of its people. He said that SAD-BJP alliance government was the only party which was alive to the hardships faced by the common man and the overall development witnessed in the state during its nine year stint was unprecedented.Prominent amongst others who were present on the occasion included; Education Minister and MLA Ropar Dr. Daljit Singh Cheema, Special Principal Secretary to Chief Minister and Commissioner Ropar Division Mr. S. Karuna Raju, Deputy Commissioner Mr. Karnesh Sharma, DIG Ropar Division Mr. KS Sandhu, SSP Mr. Varinder Singh, Chief Engineer Water Supply & Sanitation (North) Mr. Daljit Singh Cheema and SGPC Member Amarjit Singh Chawla. Apart from these, several senior leaders, party workers of SAD-BJP and members of SGPC were also present during the Sangat Darshan.